In 2015, Viaje Cigars launched a cigar known as the Viaje Jalapeño. One thing Viaje Cigars was well-known for its themed releases. The Viaje Jalapeño introduced a farm-grown peppers theme. The Jalapeño would come in a very unique figurado shape that was made famous with the Viaje Exclusive Chiquito which one could argue looks like a pepper. Like most of Viaje releases, the Jalapeño was a small batch release – and like many Viaje releases the details were shrouded in mystery. In 2017, the line would see the second installment to expand, with the release of the Viaje Ghost Pepper. Since then there have been three additional releases in the line. Today we turn our attention back to the Viaje Ghost Pepper and take a closer look at this cigar. It’s a cigar that has been aging in the Cigar Coop humidor for 22 months. The formal name of the ghost pepper is bhut jolokia. It is hybrid chili pepper which originated in India. In 2007, it was certified by the Guinness Book of World Records as the world’s hottest chili pepper. That record would be broken by the Carolina Reaper in 2013. The 2017 release of the Viaje Ghost Pepper appears to have been a one and done release. 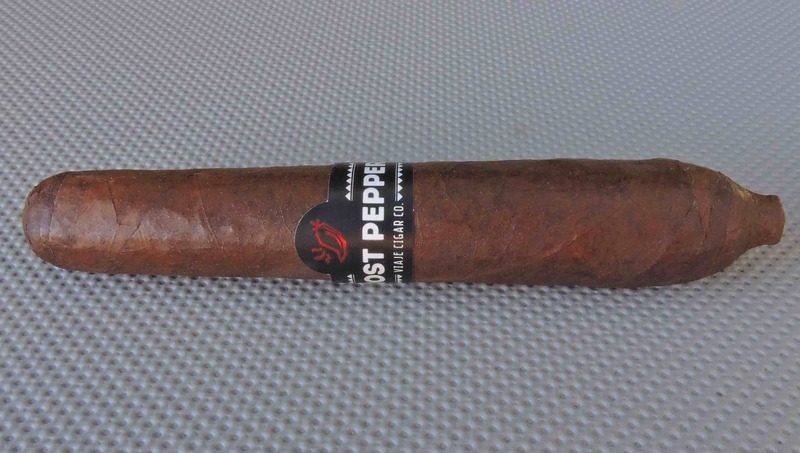 Viaje Cigars’ founder Andre Farkas said the Ghost Pepper was retired due to issues of using the name “Ghost.” It might be why the third pepper release, GP 10.31 was named as it was. Without further ado, let’s break down the Viaje Ghost Pepper and see what this cigar brings to the table. As mentioned, details of the Viaje Ghost Pepper are shrouded in mystery. As a result, details of the blend of the have not been disclosed. The cigar is made at the Raices Cubanas factory in Honduras. 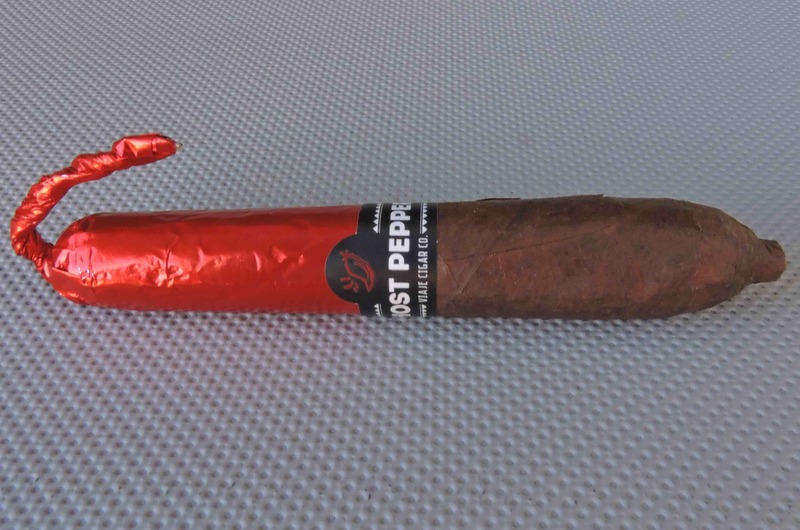 The Viaje Ghost Pepper is available in one size – a 4 7/8 x 51 figurado. The cigars are packaged in 25-count boxes. The Viaje Ghost Pepper’s wrapper has a roasted coffee bean color with a deep cinnamon tint. There is some oil on the surface of the wrapper. It has a relatively smooth surface with any veins that are visible on the thin side. The darker color of the wrapper does an excellent job at hiding the seams. The figurado of the Ghost Pepper almost has a salomon-like shape with a short 1/4 inch nozzle-shape on the footer. The footer is open with a short diameter. The cigar has its widest point just above the nozzle-foot and tapers toward the cap. The Viaje Ghost Pepper features a black colored band at the center of the cigar. The text “GHOST PEPPER” appears on the band in white font. Above the text is small red pepper design. There are some white adornments across the top and bottom. In the middle of the lower adornments is the text “VIAJE CIGAR CO” in white font. There is a red foil covering the upper part of the cigar from the band to the cap. The foil is twisted at the cap to give the appearance of a pepper stem. After removing the foil, a straight cut was placed into the Viaje Ghost Pepper. Once the cap was removed it was on to the pre-light draw experience. The dry draw produced a mix of earth and a mild mixed pepper note. Given this was named Ghost Pepper, it was a little surprising the dry draw didn’t produce a lot of spice. Still, this cigar produced a satisfactory pre-light draw. At this point, it was time to light up the Viaje Ghost Pepper and see what the smoking phase would have in store. The Viaje Ghost Pepper opened up with notes of earth, cocoa, and mixed pepper. The mixed pepper is what I would classify as a mix of black pepper and chili pepper spices. Early on the cocoa notes moved into the forefront. These notes imparted a nice amount of sweetness early on. The pepper notes, along with the earth settled into the background. Concurrently, the pepper notes remained prominent on the retro-hale. Going through the latter part of the first third, I was a little surprised to continue to see the pepper diminish on the tongue. As the Viaje Ghost Pepper moved into the second third, the earth notes began to increase and the cocoa notes started to shed some of its sweetness. Later in the second third, the earth notes were on par with the cocoa, which now had more bittersweet qualities. By the last third of the Viaje Ghost Pepper, the earth notes took over as the primary note. The pepper and cocoa notes settled in the background. There was a subtle increase in the spice on the tongue, and still some residual sweetness from the cocoa. This is the way the Viaje Ghost Pepper came to a close. The resulting nub was soft to the touch but cool in temperature. Overall the Viaje Ghost Pepper didn’t have the prettiest burn, but the burn performed well. While it maintained a straight burn path and relatively straight burn line, it did require several touch-ups along the way. The resulting ash had a salt and pepper color. This wasn’t an overly firm ash. Along the way, there was some flaking from the cigar. Meanwhile, the burn rate and burn temperature were ideal. In terms of the draw, the Viaje Ghost Pepper also performed quite well. This was a draw that struck a nice balance of resistance and openness. At the same time, this was a low maintenance draw to derive flavor from. In terms of strength and body, this was a cigar that performed at medium to full for both attributes. For the most part, the intensity levels of both attributes remained constant. When it came to strength versus body, both attributes balanced each other nicely with neither attribute overshadowing the other. 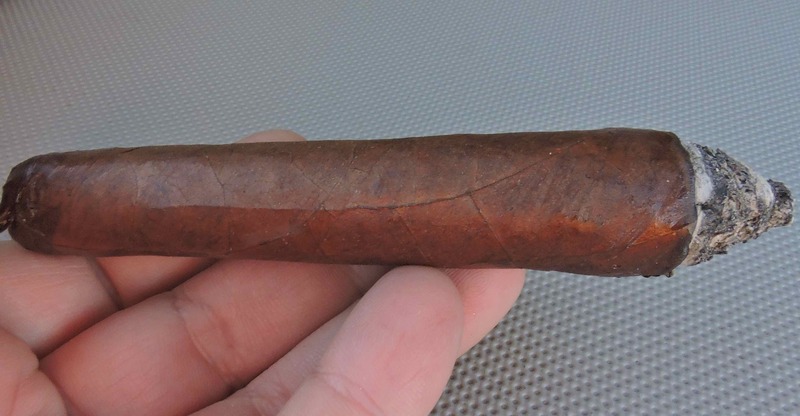 I can only provide an assessment of what this cigar has with 22 months of age on it, so how much (if any) strength and body this cigar changed over time is an unknown. 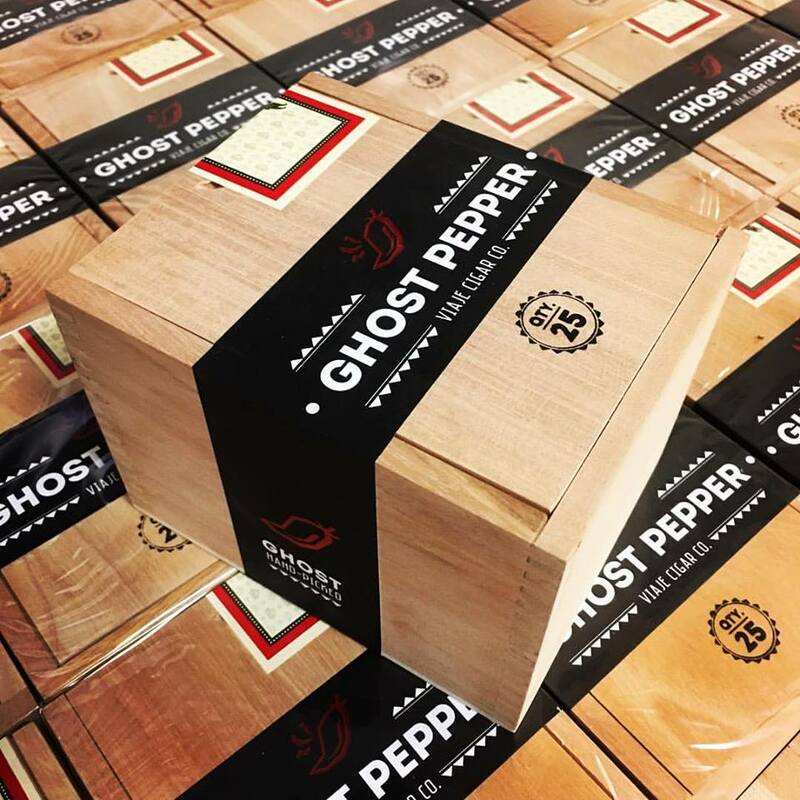 For a cigar named after something that once held the Guinness Book of World Record for hottest pepper, I was a little surprised by the performance of the Ghost Pepper. This wasn’t an ultra-strong, ultra-bold, or ultra-spicy blend. I have no historical context to measure this against, so I’m only speculating that the Viaje Ghost Pepper mellowed a bit. At the same time, this wasn’t the most complex of cigars, however I still found the Viaje Ghost Pepper to be a cigar that delivered very good flavor. It’s still a bold enough cigar where I’d steer this to a more seasoned cigar enthusiast. As for myself, this is a cigar I certainly would purchase and smoke again.